Queues and bottlenecks occur during rush hour in our cities. At other times of the day, the traffic is less active and therefore flows better. It is the same with the body and mind; when activity is reduced, we experience a less stressed and less blocked state than that which we normally find ourselves in during our daily chores. The states of consciousness were previously divided into three main categories: waking state, dream and deep sleep. But during the 20th Century, science gradually acquired a broader view of our states, as it became possible to measure the electrical activity of the brain. In the late 1960s, an American doctor, Robert Keith Wallace, had his doctoral thesis accepted, presenting meditation as a Fourth Major State of Consciousness. Since then, there have been many different publications and research into altered states. One of the major works from 1969 is still worth reading: Altered States of Consciousness, edited by Professor Charles T. Tart. It is a collection of articles from researchers all over the world. The relaxed state received scientific classification, which is practical, but also limiting. It was called the Alpha state. By pasting silver electrodes in the shape of small discs on various places on the scalp, the brain’s activity could be measured by an instrument called an Electroencephalograph (EEG). There was a row of pens on the EEG and each one was linked to one of the electrodes on the head. The pens were attached in such a way that each drew a line on a long sheet of paper that was running through the machine. Every time an impulse came from the electrode, the pen moved so that the line on the paper became a wavy line, hence the expression brain waves. Today, everything is recorded on computers, so that the waves can be analysed and displayed on a screen. The activity of the brain is commonly divided into four states. See the chart below. The more active the brain is, the more impulses per second the nerve cells emit. The scientific name of each state, its frequency of impulses (Hertz or impulses pr second, and its description are shown here. The readings sink from Beta to Alpha when one relaxes, daydreams or meditates. If the waves keep slowing down, then we enter the state of Theta: which could be either a light sleep or dream state; or a state of deep relaxation or deep meditation. If we continue descending into deep sleep, Delta waves are recorded. Today, it is possible to filter the brain wave patterns, something that was not possible in the 1960s and 1970s. This shows that these patterns are rarely pure; different frequencies are usually measured concurrently. For example, Alpha waves predominate in the relaxed state, but some Beta or Theta activity may also be present, depending on the depth of the state. If a person measured in the Theta state is aware, a percentage of Alpha waves would also be present. This can happen in deep meditation or lucid dreaming. Besides the EEG, there are other means of measuring the relaxed and somewhat deeper meditative state. Skin resistance, for example, is measured on the palm between two electrodes. If you are relaxed, then your palm is dry and you have a high skin resistance. However, if you become provoked a little, within a few seconds, the skin resistance will fall due to an imperceptible perspiration on the palm. Skin resistance is used to measure the reactions in the autonomic nervous system, and can reveal when the level of stress or anxiety increases or diminishes. A similar method is used in lie-detectors. Muscular tension decreases when you relax, just as a tension decreases when you keep a muscle stretched for a while in a yoga pose. The muscular tension is also measured by placing two electrodes on the muscle in question. The pulse drops during relaxation or meditation. As does the breath rate and frequency. “Not everyone believes they can relax, not to mention concentrate. Maybe it is true that they cannot do it just like that, by using willpower alone. Some people claim that all they need is to sit on a chair, put their feet up and close their eyes. However, they do not always show a result, for instance, if their blood pressure is measured. It is possible to have experiences with yoga, relaxation and the like and still fool yourself into believing that you are relaxed, even though you are not. I have had days when I thought it was okay to skip my yoga practise. But when I, nevertheless, took the time to do yoga, I could feel a distinct difference in my state afterwards. It is important not to be blinded by our ideas of how we feel. One should also not try to achieve a certain experience – but just follow the technique. It is easy enough to become excited or stressed. The way the body reacts during such a state is called the fight or flight response; in a perilous situation the body prepares itself to face the danger or run from it. The blood pressure rises and the blood flow to the brain and muscles increases at the expense of the internal organs. Often this automatic reaction is completely out of proportion to the situation that triggered it. Just a minor daily problem can be enough to create a stressed state. Dr. Herbert Benson from Beth Israel Hospital School in Boston realised, through his research into high blood pressure, the significance of proper relaxation. In his first book The Relaxation Response, he introduced this term in relation to methods for relaxing and lowering the blood pressure. In contrast to the fight or flight response, the relaxation response does not just come by itself when it is needed. By a relaxation technique, he means a systematic method that can provide a more effective form of relaxation than that which may be achieved by taking a stroll or a nap. Through the use of a relaxation technique, you learn to achieve a state of rest that is deeper than that of sleep, while you remain conscious and experience what is happening. With regular practice, you also become familiar with the relaxed state. The relaxation technique works by itself; you need only lie still and follow the method and the instructions given. I recently looked into the Medline database, which contains reports that have been published in recognised research magazines. It showed several thousand entries on relaxation, yoga and meditation published over the last few decades. As I went through the reports, I became aware of discrepancies in some of the them. The frustrated researchers couldn’t account for these inconsistent results. However, I promptly realised the reason: they regard all meditation as being the same, no matter what kind of method they measure. The fact is that the results largely depend on which meditation technique is used. In some meditations, you withdraw the senses; in others, you are more present in your senses. There are meditations where you make your mind one-pointed, and meditations without a focal point, which are based on the ability to experience the totality in and around oneself. Some methods give only a light relaxed state, while others produce very clear changes in your general state. Certain Tantric meditations, for example Inner Silence, are constructed as a developing sequence containing a whole array of the mentioned methods – it spans the spectrum from outer awareness to deep inner rest in oneself. Through meditation and awareness training, you will also be able to see when the fight or flight response is about to be triggered, and thereby become better at choosing how to react. What do you get from relaxing? “Wellbeing, of course,” is the answer if you ask those who know how to use a good relaxation, “and creativity.” Current research is interested in more than that though. They want to see if there are permanent and deep physiological effects. Since Wallace’s thesis in the 1960s, much research has been conducted into the relaxed state, and into relaxation’s effect on body and mind. In 1986, the New York Times published an article by Daniel Goleman, which indicated that the experimental evidence was much stronger than it had been in previous years, in favour of relaxation therapy for the treatment of many illnesses. 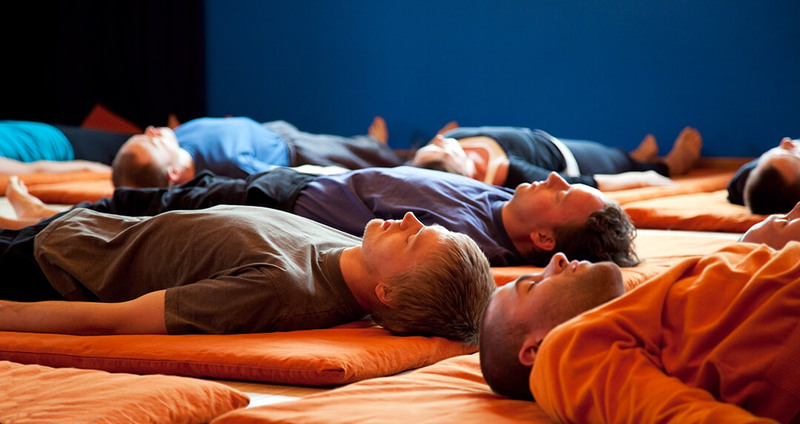 Some researchers have documented that relaxation techniques, sometimes complemented with other yoga techniques and meditation, can be used as an alternative or a supplement to traditional treatment for people who suffer from diabetes, high blood pressure, stress, sleep disorders, chronic pain, rheumatism, anxiety, cancer, psoriasis, epilepsy, alcoholism (and other addictions), to name but a few. One of the more interesting health benefits of relaxation is the fact that it strengthens the immune system. Therefore, it can help in keeping sickness at bay by making people more resistant to viruses. The degree of effectiveness naturally depends on how regularly one uses relaxation. There are numerous reports on the effect of relaxation and yoga on hypertension, but these methods also work well against low blood pressure, because the exercises normalise the blood pressure. Our experience from some of the 3 months retreats at Haa International Retreat Center is that quite a few students have achieved a cure or a complete control of asthma, being symptom-free at the end of the retreat. Today, the use of relaxation techniques is an important mainstream medical practice. It is prescribed by doctors all over the world as an alternative or complement to the treatment of chronic diseases, and even as prevention to the onset of infections. Some hospitals broadcast guided relaxations straight into their patients’ rooms. And although many traditionalists within the medical profession have been slow to recognise the value of relaxation, a new generation of doctors is beginning to see it as the first course of action in the treatment of cardiac and blood pressure diseases. As a part of an extensive research project at the University Clinic in Cologne, Germany, in early 1980, the brain waves of a group of teachers from the Scandinavian Yoga and Meditation School were measured during Yoga Nidra. A researcher who was more familiar with suggestive-based relaxation, where one imagines that one is relaxed, took part in this research. The researchers in Cologne found that Yoga Nidra had a more thorough effect than the relaxations based on suggestion or hypnosis. During Yoga Nidra, the Alpha waves covered the whole brain and were constant throughout the practice, while they occurred only partially and irregularly during the other relaxations. Furthermore, the level of Alpha waves was constant throughout the entire Yoga Nidra, while it was irregular during the other relaxations. The balance between the EEG in the two brain halves was also improved in Yoga Nidra, which means that the two brain halves communicated better. These results were again confirmed in 1997 in another research: Pictures of the brain’s activity during Yoga Nidra. During Yoga Nidra, you are not even asked to relax. The word relaxation does not appear in the instructions at all. You experience your body, its various parts, your breath, several states such as heaviness and lightness, warmth and cold; and different mental pictures and symbols. And it is this very systematic and fixed procedure that triggers the relaxation. Read more about that in Tantra and Yoga Nidra – about the knowledge and methods behind the Tantric rituals, which make the original Yoga Nidra so uniquely effective and deep. 1) Holistic GPs cut prescribing costs to 40% of average. Pulse 1989 Nov 25. 2) Treatment of essential hypertension with yoga relaxation therapy in a USAF aviator: a case. Brownstein AH. Dembert ML. 3) Effects of a behavioral stress management program on anxiety, mood, self esteem, and T-cell count in HIV positive men. Taylor DN. 4) A study of response pattern of non-insulin dependent diabetics to yoga therapy. Jain SC. Uppal A. Bhatnagar SO. Talukdar B. 5) Meditation improves clinico-electroencephalographic measures in drug-resistant epileptics. Deepak KK. Manchanda SK. Maheshwari MC. 6) What can cancer patients expect from intensive meditation? Meares A. 7) An outpatient program in behavioral medicine for chronic pain patients. Kabat-Zinn J. 8) Study of pulmonary and autonomic functions of asthma patients after yoga training. Khanam AA. Sachdeva U. Guleria R. Deepak KK.